UNITED NATIONS, March 15 -- On Ukraine, the UN Security Council scheduled a March 15 vote on a US-drafted resolution knowing that Russia would veto it. The goal was to get China to abstain. In the minutes before the vote, China's Liu Jieyi chatted with his French counterpart Gerard Araud, who has refused to answer Press questions on his country's sale of Mistral warships to Russia. When the vote came, Russia vetoed, and China abstained. Senator Bob Menendez replied that the IMF wouldn't give a dime unlesss Ukraine commits to changes. Can you say, austerity? Paul's amendment failed. Senator John McCain proposed giving the President the power to sanction "corrupt officials" in Russia. This amendment passed. Senator John Barrosso R-Wyoming tried to add the export of liquified natural gas to Ukraine. Menendez replied that Turkey would block any import of LNG into the Black Sea. Others also opposed Barrosso's proposal, calling it out of order and subject to the jurisdiction of the Banking and Energy Committees. So it goes in Washington. On March 11, the US House of Representatives went late with speeches denouncing Russia. The longest was by Rep. Steve King (R-Iowa), who recounted on the House floor history from 1941, how only because Hitler had to turn back to put down the revolution in Yugoslavia did he not conquer Russia but got stopped the month after. Rep Carolyn Maloney, Democrat of New York, said that Yanukovych had "a golden toilet." That Internet image has widely been discredited, but who's counting? She promoted an event at "Four Freedoms" park at the tip of Roosevelt Island. US President Barack Obama was in Manhattan at $32,000 a plate fundraisers, one including Mayor Bill De Blasio. Then Obama flew back to New York, where he will meet Ukraine's Yatsenyuk on March 12 at 2:45 pm. UN Secretary General Ban Ki-moon, on the other hand, is slated according to Bill De Blasio's scheduled to meet with De Blasio at 2 pm at City Hall. It is not in the UN's Media Alert, as was repeatedly requested by the Free UN Coalition for Access (whose member Luiz Rampelotto took this photo on March 12 of Ban, his head of protocol and US political guru Bob Orr). Earlier on March 11 in the US House of Representatives in DC, Ohio Democrat Marcy Kaptur recounted the suffering of Ukraine including under the Nazis; California Republican Ed Royce called for adoption of H.R. 499 before Yatsenyuk's arrival. Tomicah Tillemann, Senior Advisor to the Secretary of State for Civil Society and Emerging Democracies will travel to Geneva, Switzerland, March 11-12, to represent the United States at the 12th meeting of the Governing Council of the Community of Democracies... The meeting will address a broad range of issues related to democracy including the status of freedom of association in the world, challenges facing human rights defenders, and current developments in Ukraine. Governing Council members will recognize Moldova’s graduation from the Community’s Democracy Partnership Task Force. While in Geneva, Dr. Tillemann will participate in a number of events hosted by the CD’s working groups. These include an introductory meeting of the new Freedom of Expression Working Group and a panel discussion on lessons learned from Ukraine. Amid all this, there was some off-camera grumbling not only about impacted countries' unwillingness to impose sanctions, but in particular about France's continued sale of weaponry to Russia. While France rails against Russian actions in Ukraine and the Crimea, it is in the midst of selling two Mistral warships to Russia for $1.4 billion. On March 10 when France's Permanent Representative to the UN Gerard Araud came to the Security Council stakeout to say how concerned he is, Inner City Press three times asked about the warship sale. But Araud refused to answer. Araud's spokesperson Frederic Jung calls first on Agence France Presse, which did not ask the question about the warships. This is France's or Araud's deal: hard questions result in banishment; when Araud doesn't like a story or a quote, he threatens to sue. There was walk of (a lack of) freedom of the press in Crimea. If Araud wouldn't answer, might Delattre? Inner City Press asked UK Permanent Representative Mark Lyall Grant if in the Security Council's March 10 private meeting there was any discussion of what the US says are questions John Kerry has sent to Sergey Lavrov. Inner City Press: Question on Ukraine. Do you think there will be any opposition to Yatseniuk? He has said publicly that he’s going to address the Council on the 13th. How do you think that could play out? And also the US has said that it has asked a series of questions to Russia and basically it said that it won’t travel there until these questions are answered. I wondered did this come up in the Council and does it bear any relation, this process of putting questions to Mr Lavrov and the process inside the Council? Amb Lyall Grant: On the question of putting questions to Mr Lavrov was not raised today. Nor indeed was a possible visit by Mr Yatseniuk the Prime Minister of Ukraine. But the Prime Minister is coming to the United States this week. We understand that he does want to address the Security Council and we would fully support that and we hope that all member states would support it. Some wonder of the relation between the two processes, and of the relevance. Lyall Grant added that the UK would support Ukraine's Yatsenyuk addressing the Security Council. Inner City Press asked Luxembourg's Sylvie Lucas about Yatsenyuk's statement he "will" address the Council on March 13. She replied, We will react when we receive such a request. The US has announced that Ukraine's Arseniy Yatsenyuk will meet with President Barack Obama on March 12; he has added he will address the UN Security Council on March 13. But if UNSC Permanent Five member Russia does not recognize Yatsenyuk, can he? On Syria, France and others declared that Ahmad al Jarba is the sole legitimate representative of the Syrian people. But he was confined to a Friends of Syria meeting down the hall from the Security Council, and before that a faux "UN briefing" with the UN's Gulf & Western media club. Yuriy Sergeyev has addressed the Security Council at least four times in the last ten days. But he was Ukraine's Ambassador under Yanukovych: he is automatically recognized. With Yatsenuk, it may be different. When the UN Security Council was debating Abkhazia and South Ossetia, the US problematized their representatives getting visas to come address the UN. The US can and will let in Yatsenyuk, into the country - but will Russia, into the UN Security Council? On March 7 with little fanfare, Ukraine's Ambassador Sergeyev went into basement Conference Room 3. 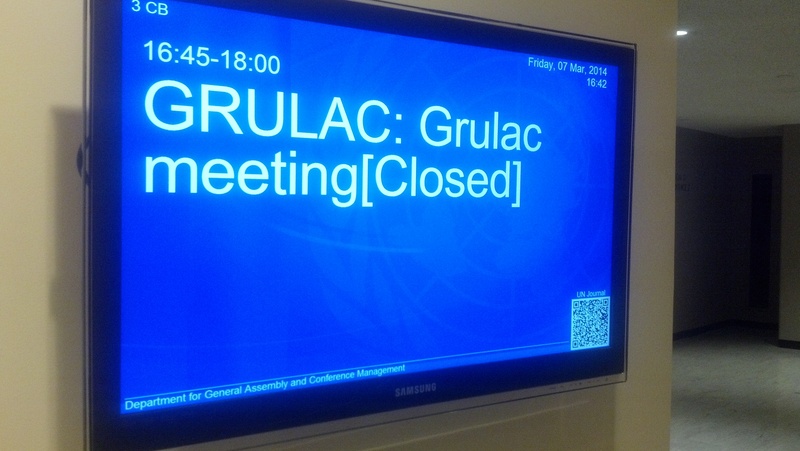 Outside the sign simply said, "GRULAC: Grulac meeting [Closed]." GRULAC is the Latin American and Caribbean Group at the UN. Sergeyev told Inner City Press he is trying to brief each regional group. But why have it closed? Inner City Press staked out the meeting, as upstairs the farewell of Ban Ki-moon's spokesperson Martin Nesirky was partially held in the room the UN gives to the UN Correspondents Association, which has become the UN's Censorship Alliance. Bottoms up! Throughout the day the rumor grew that there would be another emergency meeting on Saturday, if only to further raise the profile of the issues. At Friday's noon briefing, Inner City Press asked the departing Nesirky again about the leaked EU - Estonia audio that the same snipers shot protesters and police. Nesirky again declined to comment on the audio, saying it may or may not be authentic (Estonia has said it is). But he said these seemed like the type of issues on which the UN's Ivan Simonovic will conduct "fact finding." We'll see. In terms of fact finding: in Crimea, how long was UN envoy Robert Serry held? By whom? A day after UN Deputy Secretary General Jan Eliasson told the media Serry was threatened and told to leave Crimea, got in his car which could not move, then walked to his hotel, the story was contradicted, or exaggerated. Inner City Press asked Ukraine's Ambassador Yuriy Sergeyev about Serry. Sergeyev, at the UNTV stakeout, said that "Russian... kept him a long time." Sergeyev added that Russians now come into Crimea pretending to be tourists, for example from Kazakhstan. He told a Russian reporter that the only movement of displaced people is to Western Ukraine. Inner City Press asked Sergeyev about the sanctions announced by the US in the morning, and how things are going with the IMF. Sergeyev said his government is getting "good signals" from the IMF, and that the sanctions announcements also "send signals." Then he went into the UN Security Council, where a meeting for members only, convened by the UK, was taking place. Four hours after the US announced Ukraine related sanctions, Inner City Press asked UN spokesperson Martin Nesirky if the UN had any comment on what some of its member states, including Russia, call unhelpful and even illegal "unilateral" sanctions. No, Nesirky said, no comment on the actions of individual countries in this regard. But of course, the UN Secretariat does have comments on actions by Russia. Nesirky was asked if the UN considers Crimea under occupation. He replied that UN envoy Robert Serry felt a certain presence there. One wag - this one - asked, poltergeist? 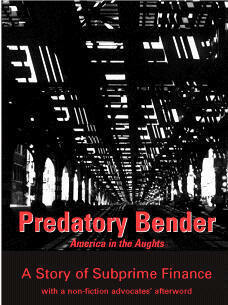 Pressed, Nesirky referred the press to Serry's interview with "Wolf Blitzer on CNN." To some it seemed, while the UN said Serry would have no press availability today, the UN was proud to get Serry - on CNN. Inner City Press asked Nesirky to confirm Serry's quotes to UAA, that he probably wouldn't go back to Crimea and would leave Ukraine on Saturday. Nesirky said he'd check. The UN's Jan Eliasson is slated to brief the Security Council by video at 2:30, in a meeting Inner City Press, as early at 7 am, was told was requested by the UK. We'll be there. "Executive Order that authorizes sanctions on individuals and entities responsible for activities undermining democratic processes or institutions in Ukraine; threatening the peace, security, stability, sovereignty, or territorial integrity of Ukraine; contributing to the misappropriation of state assets of Ukraine; or purporting to assert governmental authority over any part of Ukraine without authorization from the Ukrainian government in Kyiv." How this last criterion would have applied, say, to South Sudan or Kosovo is not clear. The White House held a background call at 8:30 am, on which a Senior Administration Official said they can also target "derivatives" - those providing material support. Another added the "OSCE team is on the ground" (see below). Meanwhile the UN on the morning of March 6 announced that while its envoy Robert Serry, threatened in Crimea the day before, will be in Kyiv, but no press availabilities. On March 5, the Organization for Security and Co-operation in Europe announced it is sending 40 unarmed military personnel to Ukraine, from twenty one countries. Inner City Press asked the OSCE to update, beyond the 18 countries in its press release, which were the three "new" contributors of personnel. The answer came: Austria, Iceland and Italy. Based on a quote from Paris, Inner City Press has asked the OSCE if it has any comment on Russian foreign minister Sergey Lavrov saying its steps "do not help create an atmosphere of dialogue"? As of this writing an hour after the question, no reply. The other 18 OSCE contributors are: Canada, Czech Republic, Denmark, Estonia, Finland, France, Germany, Hungary, Ireland, Latvia, Lithuania, Norway, Poland, Slovakia, Sweden, Turkey, United Kingdom, and the United States. On Estonia (and Ukraine) more leaked audio has emerged on YouTube, in what we're calling Kwikileaks, of the EU's Catherine Ashton and Estonia's Foreign Minister Urmas Paet. Click here for audio, particularly from Minute 8:30.
. You had a crisis inside of Ukraine as a consequence of his decision not to sign an agreement that would have oriented their economy a little more towards the West. That got out of control and we got involved only to prevent initially from bloodshed occurring inside the country and succeeded in doing that. But, ultimately, a deal that was brokered for a power-sharing arrangement in an election led to him fleeing and we now have a situation in which the Russians I think are engaging in a fundamental breach of international law in sending troops into the country to try to force the hands of the Ukrainian people. We may be able to deescalate over the next several days and weeks, but it’s a serious situation and we’re spending a lot of time on it." One key phrase was, "he had been democratically elected." "Although the Department of Defense finds value in the military-to-military relationship with the Russian Federation we have developed over the past few years to increase transparency, build understanding, and reduce the risk of military miscalculation we have, in light of recent events in Ukraine, put on hold all military-to-military engagements between the United States and Russia. This includes exercises, bilateral meetings, port visits and planning conferences. The Defense Department is closely monitoring the situation and remains in close contact with the State Department and interagency, along with our Allies, Partners and NATO. We call on Russia to deescalate the crisis in Ukraine and for Russian forces in Crimea to return to their bases, as required under the agreements governing the Russia Black Sea Fleet. Some media outlets are speculating on possible ship movements in the region. There has been no change to our military posture in Europe or the Mediterranean; our Navy units continue to conduct routine, previously planned operations and exercises with allies and partners in the region." Earlier on Monday, Russia's Vitaly Churkin came out to answer questions. Inner City Press asked him of supporting the mission to Ukraine by UN Deputy Secretary General Jan Eliasson, a former Swedish foreign minster, while questioning that of Robert Serry. Churkin replied that he had spoken with Eliasson before he left for Kyev. It is unclear if Eliasson will get to Crimea. But some note that unlike Serry, who appears in leaked audio with former US now UN official Jeff Feltman "getting" Ban to send him to Ukraine, Eliasson strives to bridge various gaps. UK Ambassador Lyall Grant came out, and Inner City Press asked him if the UK is moving toward sanctions as the US says it is. He politely declined to answer this non-UN question. Inner City Press: G8 and sanctions? There’s a lot of talk from the US side of looking at financial sanctions on individuals in Russia and there’s talk of not only not going to this preparatory meeting for the Sochi G8 but to have Russia essentially excluded from the G8 and to go back to a G7. What’s the UK position on that and at what point would that become something that you would be looking at? Amb Lyall Grant: Those issues are being discussed elsewhere. I want to focus today on the UN aspects of this. Ukraine's Yuriy Sergeyev held a long and surreal stakeout. Inner City Press asked him to explain the dispute about how many troops Russia can have in Crimea. He said 11,000 including 2,000 marines, that Russia had reiterated this again in December and was now committing "aggression." France's Gerard Araud, as has become his pattern, took only two questions: one in French, the second from France 24. After four and a half years at the UN - his figure, in the Council -- he is becoming more each day like Herve Ladsous, the fourth Frenchman in a row atop UN Peacekeeping. Click here for the story about French diplomat Romain Serman, now returned as French consul in San Francisco, regarding which despite his Mission not commenting when asked before publication, Araud chose to threaten to sue, and now not answer question. The stakeouts ended with the Moldovan Permanent Representative. Inner City Press asked him about US Secretary of State John Kerry's statement that Russia is pressuring Moldova. He spoke of troops on high alert, and another autonomous region now threatening not to participate in elections. Inner City Press asked him about the size of the OSCE mission Samanatha Power referred to. He said he's participated in three OSCE mission; he mentioned sizes between 10 and two or three thousand. So what is being referred to here? We'll have more on this. This comes after the (French national, praised as such by the French mission) new UN spokesperson Stephane Dujarric praised a 10-tweet "analysis" of Crimean involving, predictably, the assumption of Chinese and Russian vetoes, and more problematically that Argentina and Nigeria abstained "for some reason." To this view, Africa and Latin America are unknowable. But is this appropriate for an incoming UN Spokesperson? For somehow whose been in charge of UN Media Accreditation? On the IMF, Sergeyev said the Fund's team will be "on the ground" early next week. He was asked about austerity but dodged it; he said that the key is that money doesn't "disappear" as he said that from Russia did. While standing at the stakeout, a supporter of the ICC tweeted at Inner City Press if Sergeyev raised it in the Council. 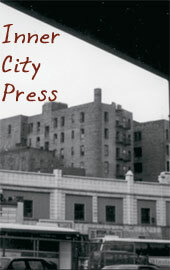 Inner City Press asked about the ICC and the extradition request to Russia. 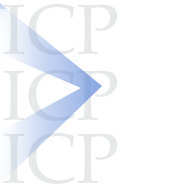 Sergeyev said the ICC is complex and that he favors a Ukrainian process first. "The United States is continuing to consider a range of options, including loan guarantees, to support Ukraine economically. But no decision has been made and the next step is the formation of a multi-party, technical government. Once that government is formed we will begin to take immediate steps, in coordination with multilateral and bilateral partners, that could compliment an IMF package, to support Ukraine." There was a lot of chatter about a $1 billion US loan guarantee, including from a roundtable by Secretary of State John Kerry held after he did an interview with Andrea Mitchell. Oh, This Town or #ThisTown. So which is it? On February 27, the IMF's Christine Lagarde announced that the new Ukraine has asked for an IMF program; her spokesperson Gerry Rice said an IMF team on be 'on the ground' next week. On February 25 the shift in Ukraine was echoed on the US Eastern seaboard. At the UN in New York, Ukraine's Yanukovych-era Ambassador Yuriy Sergeyev canceled his 11 am press conference - though we can now link to this video of his "I am with you" moment with demonstrators outside the Ukrainian mission in New York. Two hours after his February 25 cancellation, in Washington, journalists Inner City Press knows from covering the International Monetary Fund took the short walk to the US State Department's briefing to ask about pre-conditions. Follow the money. From Foggy Bottom to Turtle Bay, the view is different -- in the case of the UN, often marginal and self-serving. For example, Ban Ki-moon gave no read-out of his beginning of the year call with the president of his native South Korea. Ah, transparency. Watch this site. Footnote: On the Obama - Putin calls, Inner City Press mused it would signal a 15-0 vote in the UN Security Council on the Syria humanitarian resolution about which Inner City Press asked State Department deputy spokesperson Marie Harf earlier on February 21, click here for that.